The latest game in the popular Bloons tower defense franchise is headed to the Land of Ooo. As you could probably tell by the name, Bloons Adventure Time TD blends the Cartoon Network animated series with tower defense. In the game, the Bloons have landed in the home of Finn, Jake, and friends. And it’s up to them to pop all of the Bloons. Gamers can select from more than 15 different adventures and 50 different maps to play from. The original story also features the voice cast from the series. There are more than 200 different weapons and other items from both Adventure Time and Bloons TD history. 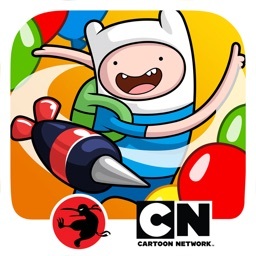 Bloons Adventure Time TD is designed for the iPhone and all iPad models. It can be downloaded now on the App Store for free. There are a number of in-app purchases available. If you’re a fan of “Adventure Time,” or the Bloons series, this is definitely a must-play. And even if you’re not, it’s a great time to check out the tower defense series.